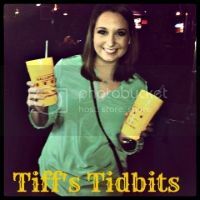 Because this blog started during a lull of college sports (aside from baseball), I'm going to do a little backtracking and talk about one of my favorite weekends in college sports: Memorial Day Weekend / the NCAA Men's Lacrosse Championship. 16 teams were selected on Selection Sunday to make the tournament (much like a smaller version of the NCAA Basketball Tournament in March) & competed in one-and-out style match-ups. 16 teams, 8 games for the first round. Despite the horrific tragedy that occurred with UVA senior women's lacrosse player Yeardley Love, both the men & women's teams entered the tournament, and the men took No. 1. Two-time defending champions Syracuse took the 2 seed, Maryland 3rd, UNC 4th, and my Duke Blue Devils rounded out the top 5. The games were fairly exciting for round-one of a lacrosse tournament. Virginia and Duke were the only ranked teams that seemed to get through to the second round with little to no effort. Virginia defeated Mt. St. Mary's by 14 goals, while Duke beat the rival Blue Jays by 13. There was talk about whether the first-ever unranked Johns Hopkins team should have been in the tournament in the first place (seemingly taking the worthy Georgetown's spot), and that was confirmed with their huge loss to a team that they have consistently beat in tournament play. Cornell and North Carolina only scraped by with their wins with one more goal than their opponent, and Maryland came back from a tie game to beat Hofstra 11-8. The two MAJOR upsets of round one were Notre Dame taking No. 6 Princeton by 3 goals and Army defeating the No. 2 Syracuse Orange team in double overtime. While I bleed Blue Devil blue and white and have for quite some time, I am also a big Tarheels fan. I realize that is essentially the equivalent of being a Michigan and Ohio State fan (definitely not as drastic), but I don't care. I like them both, and am always loyal to Duke when they play UNC in any sport. 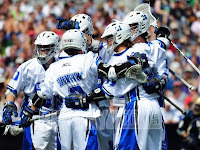 For the past two years, Duke has played UNC in the quarterfinals of the lacrosse tournament and for one reason or another, it has been impossible for me to fly to the east coast to see what would be my ultimate lacrosse game. This year however, was not nearly as exciting as last year, as Duke handed UNC a hefty 17-9 loss and Cornell knocked unranked Army out of the tournament 14-5. The two nail-biters were the one goal UVA-Stony Brook game that UVA pulled out in the end for a 10-9 win, and the unranked Notre Dame team taking down No. 3 Maryland 7-5 to move onto their second final four appearance ever. Saturday afternoon came and went as Notre Dame handed Cornell a 12-7 loss to move onto their first championship game of the program's history. Saturday evening was my game to watch. I was at a friend's house and refused to sit outside where the food was being grilled and served because I couldn't see the TV from the deck, and everyone relentlessly cheered for UVA just to piss me off. I was on the edge of my seat the entire 60 minutes, screaming, yelling, and almost throwing things at the TV. The game ended with a goal zipping by UVA's goalie in the final seconds of the game, giving Duke the 14-13 win after UVA came back and brought it to a 13-13 tie with just minutes left in the fourth quarter. I was ecstatic: Duke (as one of my good friends and avid-Duke hater has always said to me) is always the bridesmaid and never the bride. They have been jipped out of too many championships to count by a few seconds or one goal. I was also ecstatic to have Duke play Notre Dame, as I knew former and current players for their team and was excited to see them do so well. 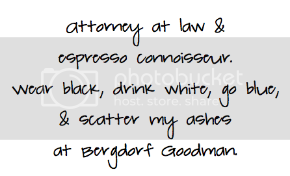 I couldn't have picked a more perfect final for myself if I tried. The final game, however, left much to be desired. 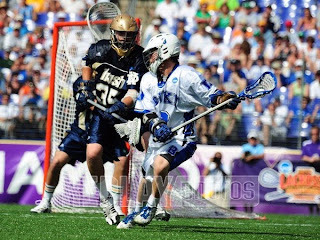 Notre Dame kept Duke at bay the entire 60 minutes of playing time, keeping the tempo slow and steady and not allowing the Blue Devils to make their usual run of lightning-fast goals by Ned Crotty or my personal favorite, Max Quinzani. Instead, at the end of regulation it was just 5-5, and I was stunned at how awful my team was playing. I just wanted to close my eyes through overtime and hope for the best. Thankfully I didn't however, because I would have missed overtime completely. 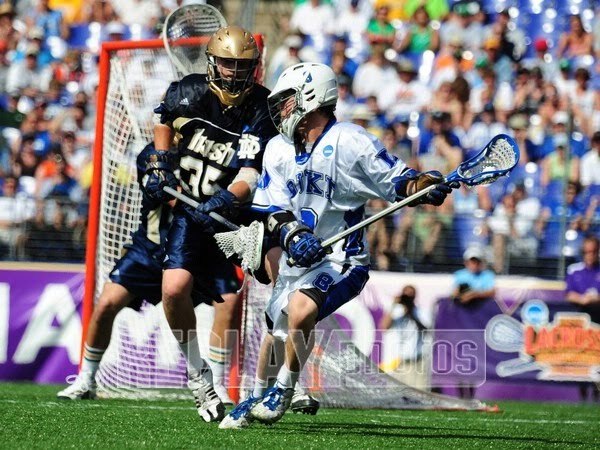 As soon as the ball went down for the face-off, Duke sophomore CJ Costabile got the ball and took the longstick to tournament MVP and Notre Dame goalie Scott Rodgers and took his best shot. It was the shot of his life. Costabile scored the game-winning goal, leaving the score 6-5 and giving the 19 graduating Duke seniors a 16-4 season and a storybook ending to the hell they endured as they started on the lacrosse team in 2006. With their teammates facing criminal charges and the prospect of the entire program disbanding, things looked bleak for those incoming freshmen. And now four years later, they have their first lacrosse championship. on their 2010 National Championship.